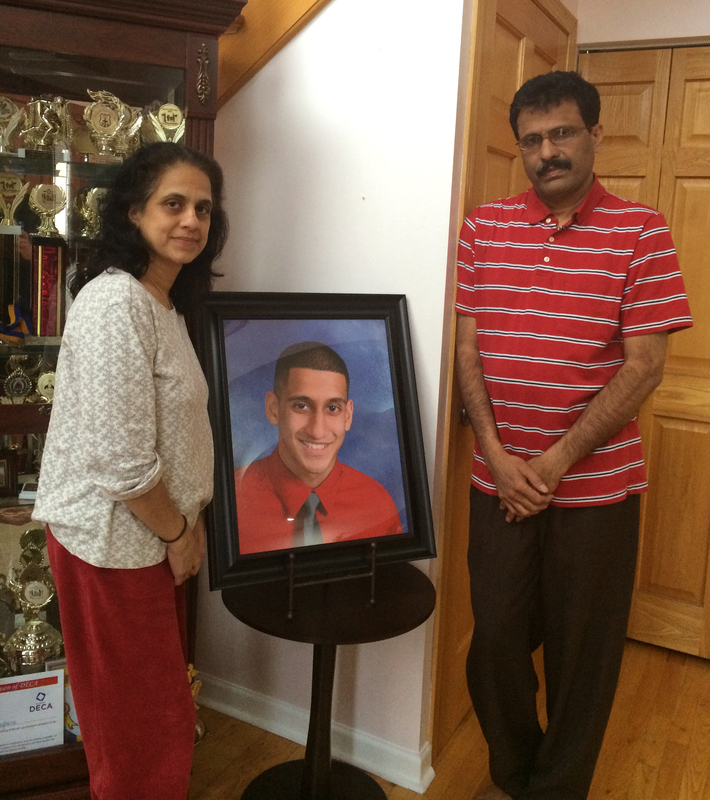 As Pravin Varughese’s parents grieve their son’s loss, they still have unanswered questions regarding his death. “It’s a nightmare to not know what happened,” said Pravin’s mother, Lovely Varughese, on a snowy April 14. Her son had been attending Southern Illinois University since 2012 as a criminal justice major. While he was living in Carbondale, his mother said he had been working as a delivery driver for a local Jimmy John’s. While he was a Niles West High School student, she added, he had been a long distance runner on the school’s cross-country team. These facts are why she has called into question the narrative Carbondale police gave her regarding her son’s death: that Pravin got drunk, couldn’t figure out how to tell the person driving him how to get home and then froze to death after getting lost in the woods. Varughese was last seen alive in the 600 block of West College Street around 11 p.m. on Feb. 12, leaving a party, said Carbondale police. Before Varughese went missing he tweeted, “Bloody knuckles… Guesss i was in a fight #backdown,” from his mobile phone at 9:17 p.m. on Feb. 12, according to the tweet’s online metadata. During the following days, authorities and volunteers scoured the woods near his last-known location, looking for the missing student. The Illinois State Police Aviation Unit, Black Diamond Aviation, and local search and rescue K-9 all joined the search. As the days rolled by, Pravin’s family, desperate to find their son, announced a $15,000 reward for information on their son’s whereabouts. After five days, Jonathan Stanley, a West Frankfort resident, contacted police and directed them to the last-known person who saw Pravin alive, the driver who gave him a ride that night. Thanks to the tip, Pravin’s dead body was found in the woods in the 1400 block of East Main Street the morning of Feb. 18, about three and a half miles from his home at the college. Pravin’s family had gone to Carbondale and was staying at the The Quality Inn at 1415 E Main St, just off of Highway 13. At the time, a statement from Carbondale Police Chief Jody O’Guinn said investigators believed the difficult terrain and low temperatures led to his cause of death and suspected no foul play. Later, initial autopsy results from the Jackson County Coroner said Varughese died from hypothermia while toxicology reports were still pending. As of April 18, Jackson County officials have yet to release the results of the toxicology report. Lovely Varughese said her concerns regarding Carbondale police’s investigation began when they told her she would need to wait until the body was taken to Chicago before she could see the body. She said police eventually relented and allowed them to see the body after the chaplain intervened on the family’s behalf. Lovely Varughese said when family was taken to the hospital where her son’s body was waiting to be autopsied, they could see only his face. She said police told her Pravin was found wearing his jeans and had his shirt tucked under one of his legs with no shoes and one sock on. The morning of Feb. 19 Lovely Varughese and her family headed to the parking lot of the Buffalo Wild Wings at 1435 E Main St., Carbondale. She was looking at the woods that border the parking lot to the southeast, trying to figure out where he was found. She said initially detectives were hesitant, telling them the terrain was so difficult and dangerous they would need specialized equipment to get to the private property about a football field’s length into the woods. Again the chaplain petitioned on behalf of the family, and police then took the family into the woods. The driver told police Pravin had exited the vehicle at a bridge on Highway 13 about 350 yards northeast of the Buffalo Wild Wings at 1435 E Main St, said Lovely Varughese. The National Weather Service said the weather around 1 p.m. on Feb. 13 had hovered around 12 degrees, while the sky was mostly clear. She said police told her that after they had gotten a tip from Stanley about the driver, who lives 40 miles away from Carbondale, they began trying to track him down. “After police brought the driver in, he showed them where he dropped Pravin off,” said Lovely Varughese. Police told her Pravin was believed to be drinking at the first party and left that party to attend a second party. The driver had offered Pravin a ride from the second party after the people there wouldn’t let their son inside. She said police described the driver as a “recent acquaintance” of their son who was not a student at SIU. The driver reportedly got onto Highway 13 while Pravin was on his phone. Once on the highway, she said police told her, Pravin was probably drunk and couldn’t give the driver directions on where he lived. She said police told her this led to a fight between Pravin and the driver, who reportedly pulled his car to the side of the road, parked, and continued to fight with her son outside the car before Pravin ran into the woods. “That was the story we were told,” said Lovely Varughese. She said police then asked when they were going to pay the reward money they had offered for information on their son. She said their hesitation to give out the money was because through their own investigation into the matter, they were told that Stanley, the man who told police where to find the driver, is possibly related to the driver. Because of the Varughese’s hesitation in paying the reward money, Stanley began calling the Carbondale police department “on a near-daily basis asking how he could get in touch with your family,” said a letter sent to the Varughese family from Carbondale police Det. Brandon Weisenberger dated Feb. 26. One of the cell phone numbers Stanley provided to police for the Varughese family was actually for one of his friends, who would only give his name as Dylan, and said that Stanley had given police an incorrect number because his phone had been cut off in February. When The Bugle reached Stanley, he said he had talked with Weisenberger only twice and had not been contacting the police on a daily basis. “I don’t give a damn about that reward money,” said Stanley. He also did not comment on his relationship to the driver. Lovely Varughese said eventually Jackson County Coroner Thomas W. Kupferer contacted her to say her son tested negative for drugs and alcohol in his system, and died of hypothermia. It was around this time news that an Illinois State Police trooper had pulled over the driver after he had left their son by the road on Feb. 13 had become public. Since then, the Varughese family says Jackson County has denied their lawyer’s repeated requests for the police and autopsy reports related to their son’s death. The Bugle reached out to Carbondale Police for clarification regarding the relationship, if any, between the witness and driver and the Jackson County coroner’s office’s autopsy and toxicology results. At press time the agencies had not returned either request. “Our state’s attorney’s office is not commenting on this issue at this time because of the ongoing investigation,” said Jackson County State’s Attorney Michael Carr in a statement to The Bugle. His office took on the investigation as conflicting narratives surrounding the night Pravin Varughese went missing started to become public. “In about four weeks, the results from the autopsy should be back,” said Ben Margolis, a forensic pathologist hired by the family and founder of Autopsy Center of Chicago. They want him to take a second look at their son’s cause of death. Adding to suspicious circumstances, Lovely Varughese said her son had called a female friend from Chicago around 12:29 a.m. The call lasted about three minutes and Lovely Varughese said the friend didn’t hang up right away because she was used to getting prank phone calls from Pravin Varughese. “She told us she picked up the phone, but that Pravin did not respond,” said Lovely Varughese. Moving forward Mathew and Lovely Varughese have started a petition at justiceforpravin.org. Their goal is to show the public’s demand towards more information regarding their son’s death. At press time they had 17,499 signatures toward their goal of 25,000. “They need to tell us what really happened that night,” said Lovely Varughese. © 2014 Bugle Newspapers. All rights reserved. This material may not be published, broadcast, rewritten or redistributed.